The original line of high quality illustrating tools used for decades by professionals around the world. * Preferred for architectural design product rendering and other forms of industrial design they are also popular for use with models ceramics and similar projects. * Ideal for all calligraphy airbrushing and graphic arts needs. * The broad nib offers smooth consistent coverage for larger areas while the fine nib allows for easy detail work. * Compatible with the Copic airbrush system. 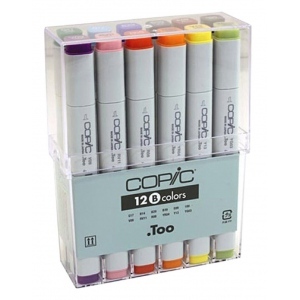 * Color choice is expandable to include the entire selection by purchasing various ink refills and empty markers.